As a writer and reader of medieval and fantasy literature, I have found a new author to follow. 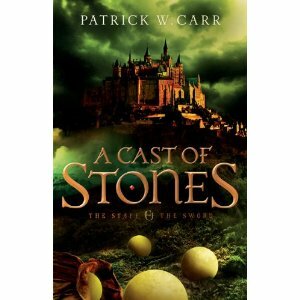 Patrick W. Carr’s debut novel, A Cast of Stones, is the first in The Staff and the Sword series, and if the sequels are as good as the first book, then Carr is on his way to an outstanding writing career. The story centers on Errol Stone, a nineteen-year-old boy, who was orphaned at fourteen. Due to the pain and loss, Errol turned to ale to drown his sorrows; however, Errol is hired to deliver an important message to a hermit priest who has been living in the wilderness, along with another churchman, for five years. What started as a simple job to deliver a message turns into a journey of intrigue, mystery, danger, and discovery. Errol, it seems, has a gift, which allows him to cast and read lots in order to predict the future. His gift makes Errol a person of interest as a potential member of the Conclave, an order of readers that serve the Church and the King, but his ability also makes him a target by an unknown enemy. Errol is chosen to join the priest and his friend, a member of the Conclave, to journey to Erinon, the capital city. Along the way, Errol learns from the two churchman and their protector Cruk, one of the captains of the Watch, the king’s guard. He learns to read, learns to defend himself, learns how to begin the struggle to break his addiction, and learns that he has a part to play in the future of the Church and Kingdom although he does not understand nor realize how important he is until much later. During the journey, an enemy attacks and Errol is thought dead, but Errol survived a fall into a rushing river, and finds himself alive and on the mend due to the kindness of a farmer and his family. In addition to his physical injuries, Errol begins to heal from his addiction to ale. The farmer also teaches Errol how to fight with a staff. After a few months of healing and training, Errol is forced to leave the farmer’s family when he discovers that enemies are pursuing him. He leaves and resumes his journey to Erinon. Along the way, Errol joins a merchant caravan and signs on as a guard. During his travels with the merchant, he practices and improves his fighting skill, but his ability to cast and read lots is discovered, which places him in danger as the caravan owner forces Errol to use his gift to bring the merchant profit, which is an illegal and blasphemous activity; however, Errol has no choice if he is to survive. Through challenging his way through every guard, Errol fights and defeats all, including the highest guard and the merchant, who is a very well trained fighter in his own right. He escapes, eventually makes his way to Erinon and rejoins his companions. In the palace, Errol finds that he is in as much danger as he discovers that he, not his companions, has been the target of the enemy all along. He discovers that he not only has the ability to cast lots but also the ability to read lots cast by other readers. He is the last know living person in the kingdom with his specialty ability, which makes him an asset to the Church and Kingdom and a threat to the enemy. Patrick W. Carr writes a wonderful story with colorful and deep characters. Errol’s story shows that a person’s life can change from poor and painful circumstances to one of importance. One person can change, heal, and grow from the past into someone of great worth who can meet his or her calling. My rating of Points of View is 5 stars.